Yoghurt sold in shops often have artificial flavorings and high sugar content. If you prefer natural yoghurt, why not try and make your own? This handy thermometer makes it a breeze – and you also save money. 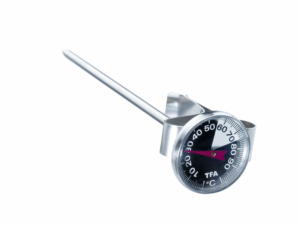 Due to its practical shape, you can also use the thermometer to stir the milk during heating, so there’s no need for an extra spoon. The thermometer is entirely manufactured in Germany.